On November 8th, the Delta Emerging Leaders will be hosting the 2nd annual Green Soapbox, one of the premiere events for young green professionals. Starting in 2011, the Green Soapbox events will feature themes. This year's theme for this one will be: "Innovators"; featuring some of the most exciting projects happening in the Chicago area. The featured projects will be from the Chicago Rarities Orchard Project (CROP), a non-profit focusing on revitalizing rare fruits for public appreciation and consumption, The Bloomingdale Trail; an organization planning a "linear garden" using closed L tracks, and The Plant, an ambitious building project on the city's southwest side that will provide a green businesses incubator and due to various technologies, will be zero-waste. The event will be held at Revolution Brewing (2323 N. Milwaukee Ave.) in their newly built second-floor space. Along with networking and programming, there will be green trivia and appetizers and beverages provided by Revolution. 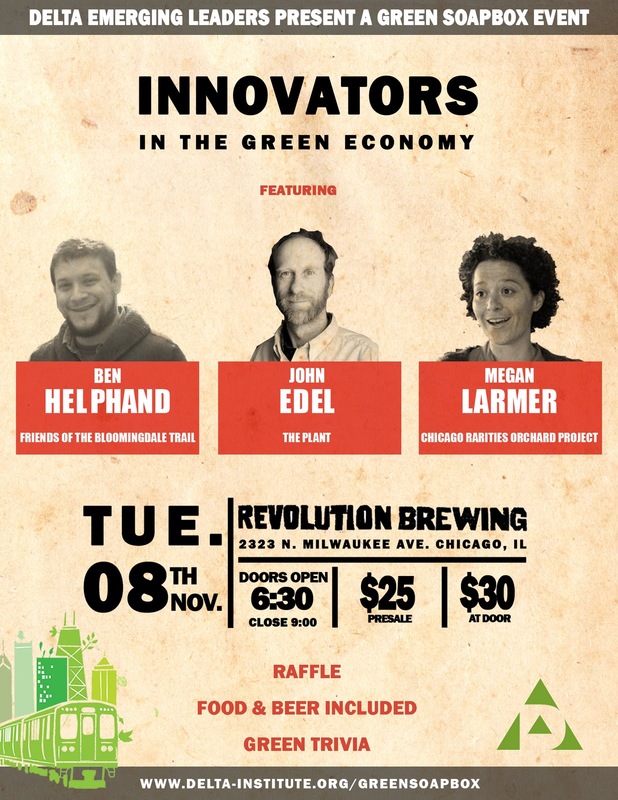 A pre-registration link is available: http://www.delta-institute.org/greensoapbox for the event , with a cost of $25 pre-sale with drinks and food included. The event will start at 6:30pm and end at 9:00pm. Don't miss out on this great opportunity to connect with young professionals with an interest in making the city and the world more sustainable! For more information on the Delta Emerging Leaders, check out their Facebook Page to see what other community and green events they are doing in the near future.